This quaint building in historic Mount Pleasant was built in 1899 as a post office by Henry Patjens. It originally sat on Church Street, and Patjens owned a store next door. 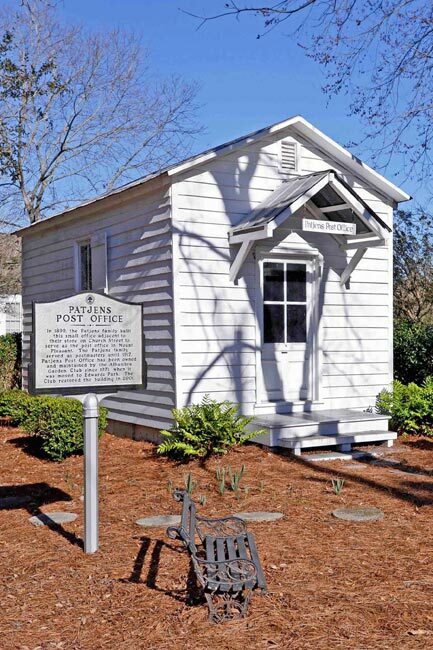 The small structure served as the first free-standing post office in Mount Pleasant. Henry Patjens acted as postmaster for the town for several years and was succeeded by his son, John, who was postmaster until 1917. The post office measures 15 feet by 20 feet. In 1971 the post office was donated to the Alhambra Garden Club by a Patjens descendant. At that time, it was relocated to its current site on the corner of Pitt and Bank streets in Edwards Park. The club restored the post office in 2001. Today park visitors can peer inside the building and see artifacts from its days as a post office.